DC Motors - What would Dennis Do? Ok so I get many questions on DC fan motors used in the inverter air conditioners. They are quite easy to test but you need to have required state and territory electrical licences to do so. They are just not a split phase motor , so assuming they are will cause confusion. Ok so , first off the wiring format i have provided is from a global AC manufacturer, make sure your fan motor is similar. You might find that the indoor and outdoor motor are the same control arrangement. They are a 7 pin plug with pins 5&6 un-used. To operate they need a power supply of 15Vdc from the pcb to pins 3&4, without it , they are dead. This is part of the Vcc control voltage power up for all to operate. **note that pin 4 is always a common or 0vdc reference to all other inputs. 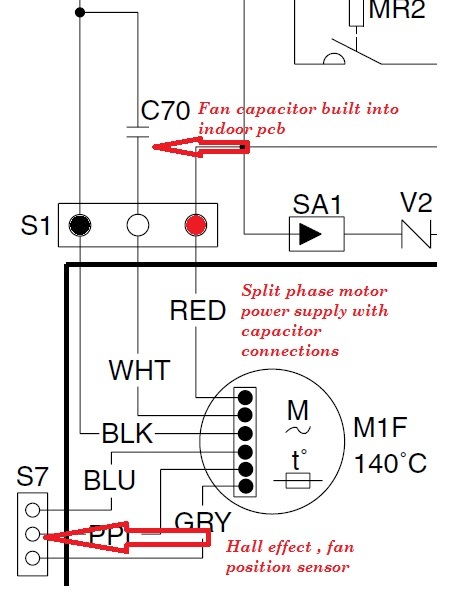 In order for the fan to start the pcb sends a command voltage of 1-6vdc to pins 2 & 4, the more voltage the faster the motor should gain in RPM or speed. The motor has a position signal or hall effect IC that will send a 15Vdc tach signal back to the pcb on pins 1 & 4. usually two 15Vdc pulses per rpm. When the tach speed is matched to required motor rpm for the needed speed eg , high med , low etc then the pcb stabilises command voltage. They fault when the required rpm tach speed is not returned by command input. eg a motor lock, this generates faults. In the ,majority of cases the motor is at fault with issues , however you can check all inputs of power without the fan motor connected to the pcb to prove the pcb ok. Only the motor pulse signal requires you to plug it back in to test it. You should never plug a DC fan motor like this into a live pcb as it will destroy the motor and pcb circuitry instantly. And yes it is not safe to anyway. In many cases motors that fail can backdamage the inverter IGBT and vice-versa. As long as the checks done prove successful , the motor is typically the issue. DC permanent magnet motors do not spin freely without ballast weight by the fan blade. If you are checking them new and not attached to a fan blade, the will only spin a couple of turns. So again do not confuse them with an AC split phase type. These are the typical motors seen on air conditioning and refrigeration systems. Typical DC brushless permanent magnet motor I/O structure. 7 pin plug , 5 wire interface. 240Vac , 2 pole. Main & Auxillary winding low torque. Induction motors suffer from slip losses where their rotating magnetic fields are faster than their rotor speeds. This makes them less efficient than a DC permanent magnet type motor. Used on smaller indoor refrigerated evaporators or condensers where statical air resistance pressures through the evaporator/condenser are much lower and blade weight lower. DC Brushless outdoor permanent magnet motor. AC Phase control motor. Two plugs. Larger plug contains the 240vac regulated phase power supply with the centre wire for the motor run capacitor which is split to neutral. The capacitor is fixed permanently on the indoor unit PCB The smaller plug contains the low voltage (15vdc) power supply for the Hall effect sensor that tachs speed reference dc signal back on the centre white wire. The motor typically is at full rpm around 202 Vac. (see previous posts on phase control motors) Phase control motors are used extensively on the majority of AC splits that are basic models for indoor fan control and they operate very effectively but never realise the energy savings as the DC motors do. For cost they perform well in more economic models. The changes have begun folks and you may not be aware yet. EBM-PAPST EC motors which employ the use of electronically commutated motors using brushless DC technology. A new IQ series design which replaces conventional AC induction squirrel cage. There wont be the usual inveter tech to be seen either , it is all encased in the motor housing. Good on EBM-PAPST too... Industry working with industry. 1 - The condenser fan motor will draw less amps than coventional induction motors of 22 to 26 watt., eg 0.22 amps compared to 0.55 amps. Check the electrical data label. 6 mega ohms giving you the impression that something is not right. Well in this case you are reading diodes not windings. It is all great and fine. "DON'T PANIC"
3 - The motor casing is all shiny metalic , being designed to transfer. internal SMPS load to the casing as a heat exchanger rather than use heat sinks. It also has the advantage of airflow from the condenser air. Line/ Neutral power supply which is designed to fuse on high voltage to arrest damage/explosion to electronic components This might be locally placed in the electrical box and make no sense to the average refrigeration mechanic.Its there to protect the motor electronics against high voltages. So IF you have a really high resistance condenser fan motor, WELL hey its not an issue, it might EC - electronically commutated. You heard it here, but hey , you might have it already. They do not look a lot different and they wire up to the electrical box with the same L/N and earth so many might miss the fact they are EC.